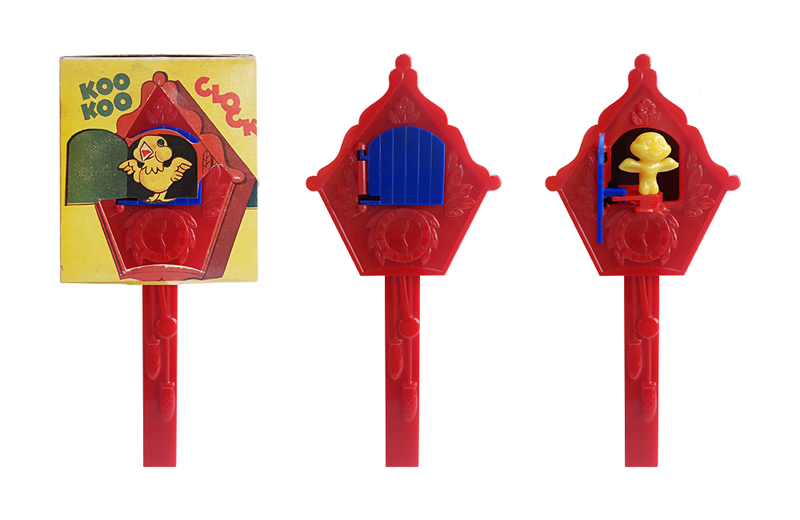 Before becoming one of the most prolific toy design & engineering firms, Marvin Glass & Associates dabbled in the design of novelty toys that were acquired and sold by various toy companies throughout the 1950s. One such example is The Kiddie Koo Koo Clock from Topper Toys. Generating Koo Koo sounds involved blowing into the mouthpiece while moving one’s thumb up and down to cover and uncover a hole in the stem of the toy. The more rapid the movement, the faster the Koo Koo sounded. At the same time, a “Birdie Lever” directly above the mouthpiece was forced open by the upper lip, causing the blue door to open and a spring-activated yellow birdie to emerge.